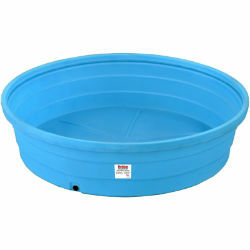 Round tanks have a “formed open” rim. New heavy duty, molded-in aluminum drain fitting and 1¼" poly drain plug ensure a longer life than ever before. FDA food-grade approved poly, tested to -20° F, corrosion-free, impact resistant and recyclable. UV protected. Blue only.